Nathalie had a very busy life, holding down a full-time marketing job and running two of her own businesses, The Cake Boutique, which supplies speciality celebration cakes and Slimming World. All this took its toll on her back, but she had no time to do anything about it. As part of her jobs, she was constantly driving past Nicky Snazell’s Clinic but said she was ‘a die-hard non-believer’ and thought it would be a waste of time. She spent a lot of time at the gym, plus swimming and running and thought this would solve her problems, but the problems just got worse. 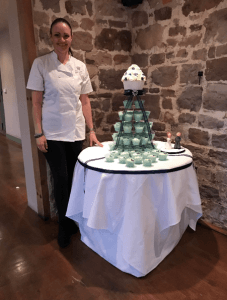 Her true passion was making speciality celebration cakes and Nathalie decided to take the plunge, quitting her full-time job, to focus on her two businesses. Unfortunately, this didn’t help the low back pain, as the increased time spent bent over cakes, plus the extra loading of materials in and out of her car, just made it worse. Nathalie eventually realised she needed help and booked in to see Anton, one of our Sports Therapists. Early treatment didn’t improve things and by now Nathalie was crying from the ongoing pain. At this point, Anton was newly qualified in acupuncture and looking for a case study. Nathalie agreed to be involved and the treatment very quickly made a big difference, helped further by the tremendous level of skills and knowledge Anton could access within the clinic. Within a few treatments, Nathalie was pain-free and was delighted. Perhaps though still a bit of a non-believer!